Hip fractures can be killers—one in five women will die within a year of breaking a hip, and one in three men. In fact, osteoporosis, the so-called brittle bone disease, is the most common health problem facing women today. 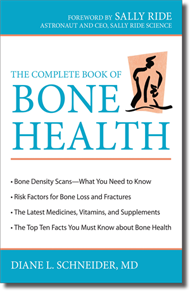 The good news is that your risk for breaking bones can be decreased or even prevented at just about any age or stage.The Complete Book of Bone Health compiles the latest information about bolstering bones, from prevention to treatment, into a single, easy-to-understand resource. Dr. Diane L. Schneider, a leading expert on osteoporosis, covers everything you should know about your bones. Using evidence-based research, first-hand stories and her own experience, she provides practical recommendations to optimize your bone health. 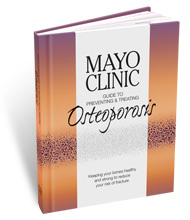 The Mayo Clinic published a practical guide on keeping your bones healthy and strong.. With Mayo Clinic Guide to Preventing and Treating Osteoporosis, you’ll discover helpful advice to guard your bones from painful fractures and the disabling consequences of osteoporosis.